In fatal accident claims, where a person is killed through the fault of another, the deceased’s immediate family (usually widow, widower, and/or children) are able to claim compensation under the Fatal Accidents Act 1976 for the hurt and losses that they suffer as a result of the death. Regrettably the present law is very restrictive as to who can claim and often excludes deserving family members that were dependent upon the deceased immediately prior to death. Aside from the limited possible dependents, the further problem is that the law in this area has to consider what would have happened in the future but for the death. The Courts have to consider a very wide range of uncertainties, which is imprecise and difficult to judge with any accuracy. Often it is ‘finger in the air’ time and see where the wind blows. The net result is that family members, in particular parents, will find it difficult to prove future dependency if their loss relates to a young child or teenager. Compensation is often limited to funeral expenses and a bereavement award in such tragic cases. The law also tended to put widows (and widowers) on trial, asking distasteful and distressing enquiries about the relationship with the deceased, the strength of the marriage, the prospects of divorce or remarriage and other personal inquisitorial investigations. As a footnote, claims involving the estate are governed by the Law Reform (Miscellaneous Provisions) 1935 but will not be considered in this article save that any compensation for pain and suffering prior to death will be paid to the estate. One interesting question is what cannot be claimed. If a person is killed instantly, the deceased estate receives nothing. Life is worthless. If there is some pain and suffering before death the Judicial College Guidelines advisers that an award for ‘mental anguish’ of up to £3,910 for fear of impending death or for a parent who loses a child. If the deceased was immediately unconscious and dies within one week, the sum of up to £2,340, the equivalent to a minor whiplash injury in a low impact rear-end shunt. However we have heard damages of over £200,000 being paid to celebrities who have had their phone tapped for breach of privacy and hurt feelings. Such awards are certainly justified, but compared to a loss of a close family member, there is no comparison. Bereavement compensation for non-financial loss such as grief and sorrow, is currently only available to the deceased spouse/civil partner or parents. The award is currently £12,980. ‘perceived as performing a further symbolic function of providing some sympathetic recognition by the state of the fact of bereavement, and an expression on the part of society of the gravity with which it regards the loss of a human life.’ [My emphasis]. In their report, the recommended damages for a bereavement award was £50,000 to be divided equally to those family members who are entitled. My view (to acknowledge the ‘gravity of the loss of a human life) is that the bereavement compensation should a minimum of upper scale of severe psychiatric damage of £100,000 but submit it should be comparable to injuries involving paralysis in excess of £300,000. In thirty years of practice, in my view, the Fatal Accidents Act is the law that needs modernising with haste. The hardship and unfairness of its application exacerbates the hurt to grieving families and must stop. Here are some examples of why the law needs to be modernised. Parents do not received a bereavement award if a child is over 18 years old. A child is not entitled to a bereavement award if he/she loses a parent. If both parents survived the death of a child, they share the bereavement award (as though the grief is of less value). Brothers, Sisters, Grandparents are not entitled to bereavement compensation. Similarly carers looking after the deceased prior to death are not entitled. The costs of looking after a dog are worth more than the loss of a child and a bereavement award. If the deceased is killed instantly, life is worthless. If a baby, young child or teenager (under 18 years) is unlawfully killed, the parents are likely to receive the return of the funeral expenses and a bereavement award only. If an adult, independent unmarried child is killed, the parents will obtain only the return of the funeral expenses. A grieving parent who takes time off work will receive no compensation for any loss of earnings. Often they have to borrow off family to make ends meet or take out loans to pay for the funeral and headstone. There are many other examples of this unjust piece of legislation. All bereaved families appreciate no amount of compensation will be enough but the level of the bereavement award must reflect the value that society puts on life. It should not be a token of recognition of grief. The public requires justice and nothing can hurt more than the unlawful killing of a close family member. To this end, the law must mirror the gravitas of the loss. It must also be noted that the Fatal Accidents Act is closely followed by the Criminal Injuries Compensation Authority where a family member is unlawfully murdered. Again the injustice continues and something must be done. 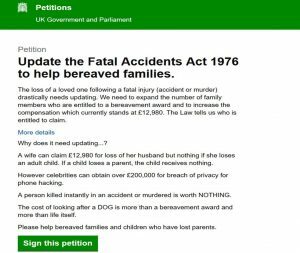 I would urge the legal profession to help support my E-Petition to change and modernise the Fatal Accidents Act 1976. Ronnie Hutcheon is a solicitor that specialises in serious injury and fatal accident claims. He is a member of the Association of Personal Injury Lawyers with over 30 years’ experience. Next post: Will The Courts Give A Literal Interpretation To S188B(3) of the Enterprise Act 2002?